A marvelous Fancy Dark Brown Greenish Yellow diamond ring. Just under 5 carats, this diamond was beautifully cut into a unique modified heart shape. The cutter did a wonderful job bringing out the rich dark juniper green, and the pale olive shades that dot the facets along the diamonds face. Furthermore, the bright yellow ‘melee’ diamonds inset in the ring help draw your eye to the central diamond itself, and illuminate it’s fantastic intrinsic color. Yellow diamonds are some of the strongest sellers at both the auction and retail levels. They’re a staple of diamond collections, and frequently command some of the highest prices at auction. 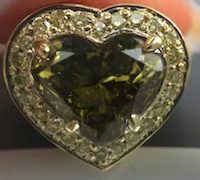 Extremely rare beautiful yellow diamonds with mixed colors such as this piece are one of a kind works of art that rarely stay available for long. No collection is truly complete without a one of a kind piece such as this.